Meet MKR Contestants and your favourite Home & Away Stars, be there early so you don’t miss out. Pako Festa has always presented a unique once-a-year opportunity to sample unfamiliar cuisine from foreign lands, or to revisit popular international dishes, in this unique multi-cultural street party celebration that Geelong has enthusiastically embraced since 1983. In pop-up food vans and marquees across the length of Pakington Street, Geelong West, and at West Park, passionate volunteer local community groups will represent the culture and cuisine of their homelands with lovingly prepared home-cooked food. The event program map will highlight the locations of all our community food stalls on the day. There will be something for everyone so indulge your senses and enjoy your entree, main, snack and dessert on the day! And the best news? You don’t have to wait until Pako Festa 2020 to enjoy many of these delights again either. Several of our diverse cultural groups have agreed to share some of their treasured family recipes, passed on from generation to generation, with the wider community. A series of locally produced recipe cards will be available to collect exclusively on the day of the event featuring international recipes from up to 20 of our local community groups. Patrons of the 2019 event can visit our community food stalls and, with any purchase, collect recipes featuring signature dishes from the following community groups including: Bosnian Croatian, Chinese, Hungarian, Japanese, Dutch, Filipino, French, Greek, Nepalese, Indonesian, Iranian, India, Loa-Thai, Macedonian, Polish, Russian, Serbian, Slovenian, Ukrainian and Wathaurong Co-Op. 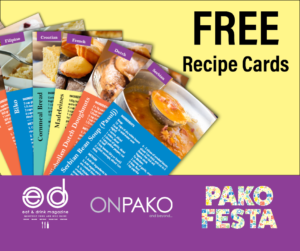 Travel the world on your dinner plate with the delicious series of Pako Festa recipe cards presented by Pako Festa in partnership with Geelong’s multi-cultural communities and supported by EDmag and OnPako Magazine. Relax with a drink in the designated licensed Furphy Carmen Miranda Bar and perhaps try a Panzerotto a little Taste of Puglia in Australia. While enjoying the colourful live entertainment on the Bank Of Melbourne Stage from 12.30-6pm. Visit the Bank of Melbourne Stall to get a selfie in the photo booth. From 9am, the street will start to fill with people who’ve come to browse through the eclectic range of stalls, selling everything from ethnic fashion to fairy wings. There will be brilliant buskers, a smorgasbord of cultural and local foods and a string of roving street performers intent on keeping you smiling. With over 200 retail and food outlets in Pakington Street, there is no excuse not to find a bargain plus, delicious food to satisfy the soul! Around midday, as the parade ends, join us in West Park for the official opening of the event. Then, over the course of the afternoon, stay and experience the street pulsating to the beat of back-to-back performances across a number of world music stages. Hundreds of performers from a myriad of multicultural backgrounds present traditional and modern music, dance and song. 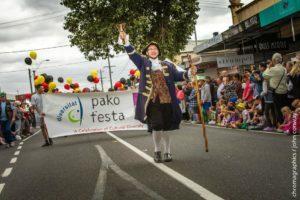 As well as introducing members from some of our newest local communities, the event continues to attract dedicated local community groups who have performed at every Pako Festa since 1983!